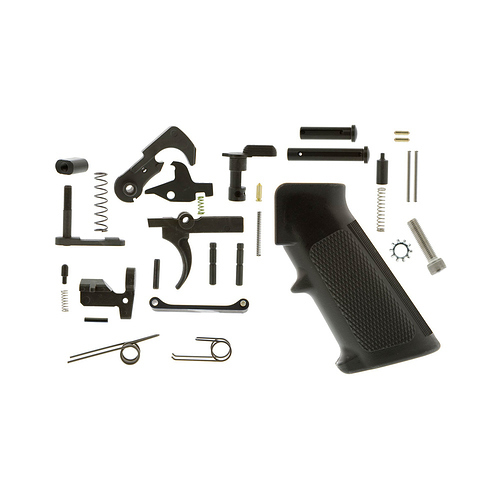 The AERO Precision AR15 lower parts kit is trusted by builders throughout the industry. AERO Precision lower parts kits are 100% made in the USA with top quality materials for a trusted fit and finish. Bolt Catch, Bolt Catch Plunger, Bolt Catch Roll Pin, Bolt Catch Spring, Buffer, Retainer, Buffer Retainer Spring, Disconnect, Disconnect Spring, Traditional Hammer (Black in Color), Hammer Pin, Hammer Spring, Magazine Catch, Magazine Catch Button, Magazine Catch Spring, Pistol Grip (A2 style), Pistol Grip Lock Washer, Pistol Grip Screw, Pivot Pin, Pivot Pin Detent, Pivot Pin Detent Spring, Selector, Selector Detent, Selector Detent Spring, Takedown Pin, Takedown Pin Detent, Takedown Pin, Detent Spring, Traditional Trigger (Black in Color), Trigger Guard, Trigger Guard Roll Pin, Trigger Pin, Trigger Spring.